Vanessa Alarie draws her inspiration from nature, Oriental art and daily life, making lacy creations, where light and shadows intermingle to create detailed, elegant works of art. 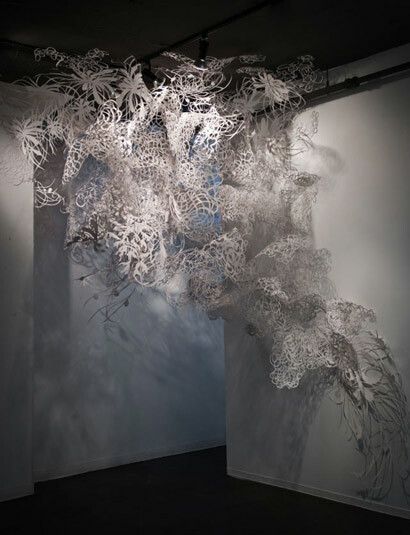 Armed with a retractable knife, she patiently and skillfully cuts away at solid pieces of paper until it is perforated like lace, then hangs the finished product. This mass of detailed cut-outs is so intriguing that it gently draws the viewer into the present moment. 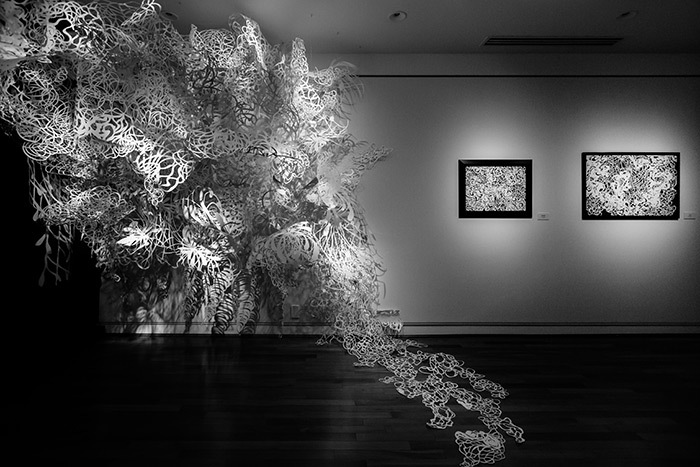 In contrast to our hectic daily life, these diaphanous installations and black and white tableaux, with their organic, geometric designs, invite us to slow down into a contemplative, meditative state. Extraordinarily original, this exhibition of decoupage will have a wide appeal beyond only art lovers.